How do I get to Tikal from Belize? Many guests want to visit Tikal, the premier Mayan ruin in the region, immediately before they join us on the island. Tikal is located in nearby Guatemala, and in many ways it is easier to get there from Belize than from Guatemala. To go to Tikal from Belize you will travel to Western Belize all the way to the border, cross on foot, then get on Guatemala transport to Flores or to Tikal itself. 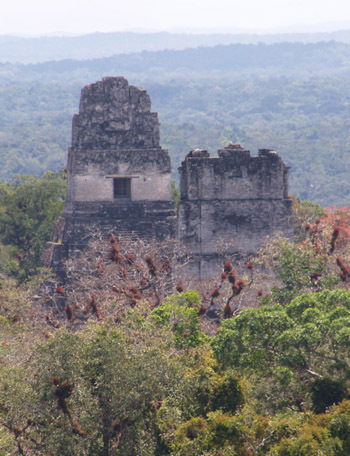 (Many people visiting Tikal actually stay in Flores.) So depending on what time of day your flight arrives, you might be able to get to western Belize the same day you fly in. On our website you can see our recommendations of places to stay in or near San Ignacio in western Belize. The next day you can then make your way to the western Belize border (just 8 miles by taxi), and on to Tikal using Guatemalan transport. When you return to Belize at the end of your Tikal visit, go all the way to Belize City and rendezvous with us at the Biltmore by 5:30 pm on Friday to meet your island group. Here’s a link to a shuttle service that can get you from the international airport to western Belize http://www.parrot-nest.com/belize-shuttle.html. It’s actually easier to get back from Tikal because all hotels at Tikal and Flores use the same shuttle service. Travelers are grouped as to their destination. So, for example, travelers to the Biltmore in Belize City will be grouped with others going to destinations along the Northern Highway. ← Looking for cheap Belize flights? Don’t hesitate!